Over three days of competition we will find the best player to represent our region at the WCS 2016 Spring Championship. The player deserving of such a title will face off against 31 of the the world's best players on the world stage. So start warming up those hands and pay close attention to the following information to find out how you can have your shot at the World Championship Series. Details on broadcasting will be revealed soon. Last edited by Baldie; Sat, 16th-Jan-2016 at 12:18 PM. When will pre-invited players be announced? Thanks. Spring? What happened to Winter Championship? ^ I thought that was the Leipzig DH, in which Probe qualified? Maybe? Pretty sure it is just a typo. 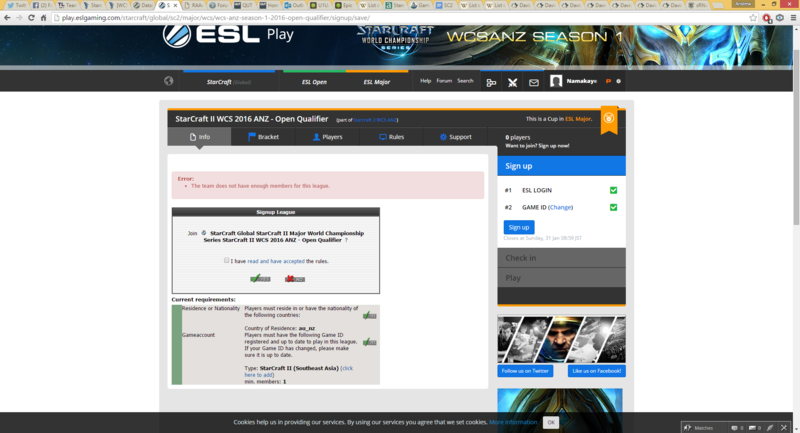 This should be qualifying for WCS Winter Championship that will take place at IEM Katowice. Winter = IEM Katowice (in March). But all the qualifier pages says it's for Spring? Also want to know who are the invited players. Just to double check, server is SEA, not AU? Just as a public announcement while I will still oversee and manage StarCraft II in our region for WCS, Ascarecrow and Bloodyrafe will be the head admins for ESL StarCraft II in our region so they are the people to talk to about issues for the tournament, sign up processes etc. Please make them feel welcome, they have both worked extensively with ESL NA and will be valuable assets. We'll be working through issues throughout the weekend so please be vocal with problems you run into. You have to play all 5 placement matches to get ranked, then find your profile on nios.kr - your name on nios should be clickable and will take you to your profile page on bnet. Last edited by VB_Blake; Sat, 16th-Jan-2016 at 2:30 PM. The game account required to register is now set to Americas. We will be utilising the Americas Server with the Australia Region. We'll be in touch with those who registered via SEA game accounts if it turns out they will need to re-register (still looking into it). Last edited by Baldie; Sat, 16th-Jan-2016 at 12:20 PM. hey guys several players did not have diamond+ accounts linked to their accounts ive sent esl messages to each of them everyone please check. any issues feel free to message me. I would like to ask if I can join even I don't have games in NA server because I practice in KR server. Should I link my KR account instead?